This month we had the opportunity to bring news of our success around the globe, from New Zealand to Virginia. Several key corporate partnerships took the October spotlight, as Johnson & Johnson joined us to present our model to traffic safety employers in the U.S. and sent more than 2,000 helmets to first grade students across Vietnam, Fedex launched Safe Kids Vietnam's Model School Zone project, and Chevron moved forward on pedestrian safety in China. We are also excited to report that schools were selected for helmet donations in Vietnam, Thailand and Cambodia under the new strategic partnership with UPS. Our success wouldn't be possible without the dedication of our exceptional partners. Also highlighted in this issue are Intel, Travel Indochina, and Go4 Bunker Cambodia, among numerous others who make improved traffic safety possible. Thank you. Norodom Sihanouk, Cambodian Leader Through Shifting Allegiances, Dies at 89 – Norodom Sihanouk, the charismatic Cambodian leader whose remarkable skills of political adaptation personified for the world the tiny, troubled kingdom where he was a towering figure through six decades, died early October 15th in Beijing. He was 89. Criticized throughout his life for dramatic shifts in allegiances, King Sihanouk said he followed only one course in politics: "the defense of the independence, the territorial integrity and the dignity of my country and my people." The biennial Safety 2012 World Safety Conference brought together more than 1,000 of the world's leading injury prevention and safety researchers, practitioners, and advocates in Wellington, New Zealand from October 1-4. 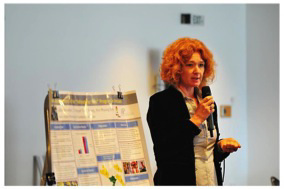 "Cross-cultural comparisons of parent's knowledge, attitudes and behaviors related to child safety;"
"PhotoVoice: Children's Perspectives on Road Traffic Safety in Ten Countries;"
"Under-reported: Child pedestrian road traffic injuries in Vietnam." Safety 2012 followed the Safe Kids Global Summit, which united 19 representatives from 16 countries in Wellington from September 28-30. Ms. Brondum presented AIP Foundation's Click on Safety program, pedestrian safety research, and Helmets for Kids evaluation. AIP Foundation Founder and President Greig Craft and Deputy Executive Director Hoang Thi Na Huong joined in the Network of Employers for Traffic Safety (NETS) conference from October 10-11 in Charlottesville, Virginia. The US-based NETS organization sponsors yearly conferences as part of its efforts to prevent traffic crashes and improve the safety and health of employees, families, and communities. Attendees, including traffic safety professionals and fleet managers representing large international firms, were able to gather, network, and share important lessons from the field. Mr. Craft was honored to be invited to present with Sandy Lee, Director of Worldwide Fleet Safety at Johnson & Johnson, on the role of corporate social responsibility, highlighting Johnson & Johnson's strategic partnership with AIP Foundation to bring essential traffic safety lessons to children throughout Vietnam. Vietnam to commemorate traffic victims on Nov 19 – Vietnam will mark the World Day of Remembrance for Road Traffic Victims on November 19 through various activities, which will help enhance compliance with traffic rules and reduce traffic accidents, said Nguyen Hoang Hiep, deputy chairman of the National Traffic Safety Committee (NTSC). Travel Indochina employees, including 29 office staff, local guides, and tour leaders, participated in traffic safety training with AIP Foundation this month. Participants learned how to identify a quality helmet and the steps to wearing a helmet safely for themselves, their families, and their clients. Together trainers and trainees brainstormed ways to incorporate road safety awareness into their daily activities and to improve their briefings on road safety for clients. AIP Foundation kicked-off Zooming in on Road Safety at an orientation workshop on October 1st with a presentation to stakeholders on its objectives, activities, and evaluation system. The new initiative, taking place for the first time this school year with the support of Intel Products Vietnam, will rally students and parents to capture the reality of young road users through trainings in traffic safety and photography for students. Tran Thi Kim Thanh, Vice Director of the Department of Education and Training (DoET), expressed her support for the program. 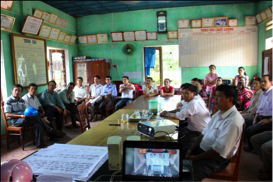 The workshop was also attended by over 50 representatives from Intel, the DoET, the HCMC Traffic Safety Committee, and District 9 Peoples' Committee, as well as local authorities, teachers, and school administrators from Tran Quoc Toan, Tang Nhon Phu B, and Phuoc Long A Secondary Schools. 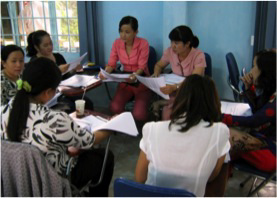 On October 5th, Safe Kids Vietnam (SKV) organized a workshop on effective traffic safety teaching methods for 30 core teachers from 30 primary schools in Phu My District, Binh Dinh Province. The focus was new educational methods, road safety information, and interactive teaching skills. Participants practiced opening group discussions, raising questions, organizing games, and incorporating physical activities into their lesson plans, and were encouraged to integrate their own personal experiences into traffic safety classes. FedEx Express and AIP Foundation launched a Safe Kids Vietnam Model School Zone (MSZ) at Nguyen Thi Minh Khai Primary School on October 18th, marking their continuing commitment to improve pedestrian safety in Dong Nai Province. Teachers, students, parents, and the media were joined by FedEx, Dong Nai Traffic Safety Committee, Department of Education and Training, and Traffic Police representatives and volunteers. 43.6% of students commute by foot, and the risks that they face include an uncovered drain along the school gate and the absence of safe sidewalks and crosswalks, forcing students to walk in the road with high traffic volume. 16.1% of students have already been hit by a vehicle while walking around the school. MSZ trains students and teachers to be safer pedestrians, provides more than 600 reflective jackets, and installs rumble strips, crosswalks, speed limit signs, traffic lights, a new sidewalk, and drainage coverage. Traffic police and commune public security officers also patrol the area to remind drivers to be cautious. This pilot will serve as an example to other schools, governments, and organizations working to improve safety by demonstrating the importance of identifying environmental and behavioral risks, the effectiveness of the interventions, and the value of data aggregation and analysis. 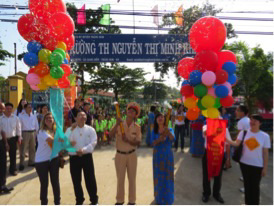 From October 22-26, Helmets for Kids top-off ceremonies took place in Quang Binh, Ha Tinh, and Dong Nai provinces. Johnson & Johnson donated more than 2,000 helmets to first grade students at twenty primary schools, as part of its commitment of 140,000 USD to AIP Foundation for Helmets for Kids. 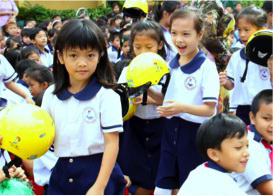 A total of 11,000 helmets are being donated to 17 schools in central Vietnam and 3 schools in Dong Nai, the largest school-based program ever implemented by the Asia Injury Prevention (AIP) Foundation. AIP Foundation also conducted crash investigations at target schools this week. Each project school sends in crash reports on the 25th of each month. Crashes are verified by AIP Foundation and replacement helmets are sent to the affected student as soon as possible. Since the first Johnson & Johnson helmet distribution in April, schools in all three target provinces have reported 48 cases of crashes, in which students wore a Johnson & Johnson helmet and were thus saved from head injuries. Officials blame adverts for drunk driving; others disagree – Advertising by alcohol companies is to blame for rising traffic accident fatalities, government officials said this week, urging media outlets to heed Prime Minister Hun Sen's earlier mandate that beer, wine, and liquor adverts contain warnings against drinking and driving. On October 10th, AIP Foundation attended the official launch of the Go4 Bunker Cambodia Co., Ltd (Go4BC) to present the achievements of the Go4 BC and AIP Foundation collaboration on Helmets for Kids in Takeo Province last year. HRH Princess Marie Agathe Odile and HE Mikael Hemniti Winther, Ambassador of Denmark to Thailand, visited AIP Foundation's booth, where t-shirts, helmets, stickers, and posters were exhibited. Rush-hour traffic slowing down – Average speeds in Bangkok dropped from 19kph last year to 18kph this year during morning rush hour and from 24kph to 23kph during evening rush hour, the Office of Transport and Traffic Policy and Planning (OTP) said yesterday. Tougher driving regulation conforms to national conditions – A driver's license regulation that imposes harsher punishments for drunk driving and running red lights conforms to both national road traffic conditions and a decade-long road safety campaign initiated by the United Nations. On October 25th, Rob Klein AIP Foundation's Global Development Director led a road safety training for Chevron's Walk Wise Project in Gaoqiao, Chongqing. 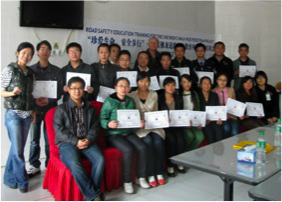 The target audience of this training was twelve teachers from Gaoqiao and Qili primary schools, who are responsible for administering lessons on road safety education to their first, third, and sixth grade students. Participants, also including Kai County police officers, officials from the Youth League, the Education Department, and the Gaoqiao Township, as well as Chevron representatives, were introduced to road safety education rationale and materials, discussed police involvement, and practiced several drills on how to behave safely in different traffic environments.